Truckers, start your engines: The Meritor ChampTruck World Series is bringing truck racing back to the U.S.
Allen Boles has been racing his black and green Peterbilt 359 for years at diesel drags, tractor pulls and anywhere else he can get his racing fix, including trips to the far north of Canada to take a turn in the Rodeo Du Cameon (truck rodeo) races. I love big trucks, and I love racing trucks,” says Boles, a Weaverville, N.C.-based 15-truck fleet owner and truck operator. In the last year and a half, Boles has stripped the 359 down, ending its tenure as a drag racer and building it up for a new venture: 100-mph road-course truck races at some of the top U.S. speedways. The new Meritor ChampTruck World Series, which will bring a true big-rig racing circuit back to the United States for the first time in nearly 30 years, will pit 12 trucks, including two racers from Boles, in 10 races nationwide this year. The first race takes place April 24-26 at the New Jersey Motorsports Park. The series will conclude Oct. 30-Nov. 1 at the Las Vegas Motor Speedway. The Aug. 28-29 races at the Texas Motor Speedway in Dallas will coincide with the Great American Trucking Show, Aug. 27-29, also in Dallas. Series creator and promoter John Condren says ChampTruck was designed to be inclusive. Competitors don’t need to spend hundreds of thousands of dollars to build a high-end race truck, he says. Small fleet owner and truck operator Allen Boles says his friends call him “Turbo” – a name he hopes to bring to the ChampTruck circuit. Boles will have on his Jupiter Motorsports team (a name inspired by Jupiter Enterprises, the name of Boles’ fleet) two Peterbilts – a 359 that Boles will drive and a 379 that his friend, Ricky Proffitt, will drive. The 359 will be black with a green frame, and the 379 black with a red frame. Boles received a ton of help from Carolina Cat and International when building his trucks. Pictured here is Boles’ 359 in its former role as a drag racer, the 359 under construction in Boles’ shop and the truck in its new form as a ChampTruck racer. In fact, ChampTruck’s rules are designed to prohibit deep-pocket spending and level the playing field, allowing enthusiasts like Boles and Mack tech Mike Morgan of Nashville, Tenn., to compete. While ChampTruck requires installation of certain safety equipment – a full roll cage, a racing seat and harness, electrical kill switches and a fire system that covers the truck – it also requires use of stock engines and transmissions. Trucks also have to be at least five years old and governed to 100 mph with a restrictor plate. ChampTruck also requires use of stock drum brakes and street-legal tires. In its first season, ChampTruck already has attracted diverse competitors. Teams include small fleets, owner-operators, a major team on the European truck racing circuit, a former NASCAR driver and companies such as Minimizer, which is entering two trucks. Competing is as simple as “reading the rules, building a truck, registering your team and showing up,” says Condren. Morgan started work on his current racer in November 2013, though he’d done some work on another truck before changing his approach. Nearly all of the build work was done in his home garage during nights and weekends, with a little help from friends and his 6-year-old son. The base of Morgan’s racer is a ’99 Mack, which he crafted by combining parts from two different Macks. It’s powered by a 2007 Mack MP7 engine. He has a small sponsorship from Winrock Truck Sales in Tennessee, but nearly all the investment came from his own pockets. Boles, like Morgan, has been working for more than a year prepping two of his Peterbilts for the racing circuit. He’ll be racing a 359, and his buddy, Ricky Proffitt, will be racing a 379. His 15-truck Jupiter Enterprises has been in operation since 1972 when his dad started the company. The fleet specializes in hauling coal from Kentucky to South Carolina. Jupiter’s trucks are still in production, but Boles’ hopes to drum up support for sponsorship once he unveils them. Boles’ and Morgan’s do-it-yourself approach isn’t the only avenue to participation. One of the four founding partners of the series, Bruce Hanusosky of Bruce Transporters, operates a million-square-foot fabrication shop in Painesville, Ohio, that builds ChampTruck’s stock racers. The series itself buys trucks and transforms them into racers, which then are either sold to race teams who want a truck or leased to competitors who want to do “an arrive and drive,” Condren says. Hanusosky also can build racers for competitors who supply their own trucks or aid teams who build their own. For example, he added the required safety equipment, including the roll cage, for Boles and Morgan. ChampTruck also owns and maintains three trucks built by Hanusosky, available for lease during the 2015 season. The ChampTruck idea sprouted when Condren visited a Truck Race Organization race in Europe a few years ago. Condren, a longtime motorsports enthusiast who’s been involved in racing in some form for 45 years, struck up a friendship with TRO owner and operator Fabien Calvet. The two met several times, eventually emerging with blueprints for ChampTruck. They added partners Hanusosky and Mike Ryan, a truck racer and stunt truck and car driver. Ryan says the series will be a great avenue to promote trucking advocacy and for outreach groups to gain exposure. “It will give the industry the chance to talk to the general public – spectators and fans – and be effective in getting some of its messages across,” he says. The series also offers a one-of-a-kind experience for race fans, Ryan says. The ChampTruck races are modeled on the popular Truck Race Organization races in Europe. Those attract an average of about 70,000 spectators at each event, with some pulling as many as 175,000. Over two days, ChampTruck competitors will race in five to six heat races. Each will last 35 minutes, and drivers earn points in each race according to where they finish. Weekend victors will be based on the point tallies, as will an overall season champion. “We total those points up at the end of the year, and whichever team has the highest points wins the championship,” says series creator John Condren. Though the truck races anchor the events, Condren and his partners bill the events as full weekends with a fair-like atmosphere of vendors, rides and kids’ areas. Between the truck race heats, supporting series like stock cars and formula cars will square off. ChampTruck spectators can pay $20 for all-day access or $30 for full weekend access. Children 15 and under get in free. All 10 races in the 2015 season will be held on road course tracks, which include left and right turns and hills, unlike NASCAR’s flat oval tracks. This puts spectators closer to the action and makes the racing more exciting, Condren says. Condren expects a dozen trucks to show up to the first event next month in New Jersey, and ChampTruck’s target is to have 15 trucks racing by the season’s end. 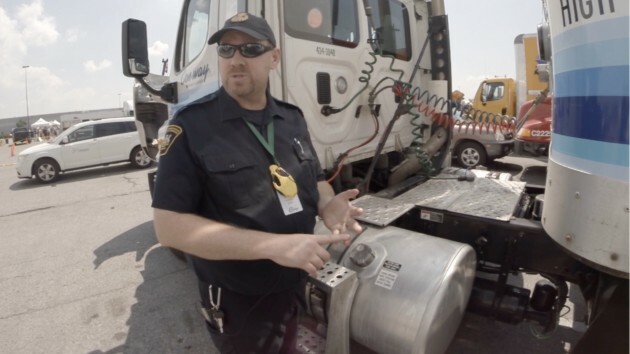 We asked MTO officer Chad King what it takes to ace the pre-trip inspection portion of the Truck Driving Championships. Read and watch what he had to say for some useful pre-trip tips. LONDON, Ont. — One of the most daunting elements of the Provincial Truck Driving Championships is the pre-trip inspection, which must be completed in less than eight minutes under the supervision of a uniformed transport enforcement officer. Defects have been planted on the vehicle, which the competitor must identify. This year in the Ontario Truck Driving Championships, for the first time ever, three drivers aced the pre-trip with perfect scores. They were: Mike Hamilton, City of Brampton; Wayne Burnett, Home Hardware; and Rob Hunter, Waste Management. We asked transport enforcement officer and judge Chad King from the MTO’s Vineland station to walk us through the pre-trip inspection component of the competition and to offer some tips on how to complete a perfect pre-trip. King explains that the level of competition has increased over the years, making it more difficult to plant defects that go unnoticed. While all drivers have their own processes and can begin the inspection wherever on the vehicle they choose, King starts at the front of the truck and works his way back. When checking the wheel fasteners, also be sure to check the washers to ensure they’re secure, King advises. He also reveals the first of five planted defects. King gives an overview of the brake system components and fluids that should be checked at the front of the vehicle, before working his way down alongside the frame rails. He inspects the fuel tank to ensure it’s secure as well as the air lines and along the way, he uncovers the second planted defect. As he works his way along the vehicle, King checks the trailer air tanks to ensure they’re well connected. He inspects the frame rail for cracks and looks for bulging along the side of the trailer that would indicate an insecure or overwidth load. He also examines the landing gear and ensures mudflaps are in place. King moves to the back of the trailer and inspects the door as well as the marker lights. He ensures the conspicuity markings are visible and examines the trailer wheels and brake systems. He also inspects the suspension system. On the passenger side of the truck, King inspects the landing gear and underhood components. Along the way, his inspection reveals two more planted defects. He also touches on what drivers should be looking for inside the cab. Having given us an overview of the pre-trip inspection, King had nothing but praise for the drivers who took part. And on a personal note, King, who’s participating as a judge for his third year, said it’s a nice opportunity to get to know the professional drivers in a more relaxed setting than what may exist at a roadside inspection station. 4. Stay calm. Work zones aren’t there to personally inconvenience you. They’re necessary to improve the roads for everyone. 6. Slow down when the signs say to. A car traveling 60 mph travels 88 feet per second. If you’re going 60 mph and you pass a sign that states, “Road Work 1,500 feet,” you’ll be in that work zone in 17 seconds. 7. The most common crash in a highway work zone is the rear-end collision, so remember to leave two seconds of braking distance between you and the car in front of you. The amount of space required to provide two seconds of stopping time will increase the faster you’re driving. To view a video about work-zone safety, click on the photo above or the play button below. To watch a video offering additional advice from the Idaho State Police, click on the photo above or the play button below. Transportation Secretary Anthony Foxx on Monday resubmitted to Congress his and the White House’s highway funding plan, which this go-around is a six-year, $478 billion transportation reauthorization package that ups both the length and the price tag from last year’s more modest Grow America Act. The bill, however, retains the same name. Chief among the bill’s highlights for the trucking industry is a measure of driver pay reform that would require drivers to be compensated for all on-duty hours not spent driving. The legislation also designated $18 billion to planning multimodal freight networks. It would award money to projects that shippers, transportation companies and other stakeholders deem would improve efficiency in the flow of U.S. freight. The bill in total relies on repatriation taxes — a 14 percent rate meant to incentivize companies to bring previously untaxed foreign earnings back to the U.S. — as its funding measure. The White House says the repatriation tax would produce nearly a quarter-trillion in revenue and would fund the $317 billion designated to roads and bridges in the next six fiscal years. FMCSA over the bill’s life would get $4.659 billion, starting at $669 million next year and rising to $831 million by the bill’s 2021 fiscal year end date. Congress has until May 31 to produce legislation to continue highway funding. They passed a stopgap measure last year when faced with the end of the two-year MAP-21 highway funding law. The White House plan, likely DOA in the Republican-controlled Congress, is one of several longer-term ideas floated in recent months. With the deadline just two months away, however, Congress may not have enough time to pass a long-term bill and may need to clear another short-term patch to prop up the struggling Highway Trust Fund. The good news is, after the stats came in for calendar-year 2013, truck-occupant crash deaths are down by a small margin, according to the National Highway Traffic Safety Administration. I know, I know, some have a problem with what exactly “large truck” means in NHTSA’s annual crash-death reports. But given that vehicle-miles-traveled estimates continue to rise with the improving economy nationwide (creating more traffic, more unpredictable four-wheelers in and around drivers’ lanes), I’m inclined to read the stats as indeed somewhat good news for operator safety. As you can see, they remained high compared to years 2009-10, but hopefully this translates to a trend in the numbers through 2014 — we won’t have those stats from NHTSA for quite a while — lower and lower. Something to keep an eye on. Overall for crash fatality statistics, truck-involved fatalities rose slightly in 2013, according to NHTSA, from 3,944 to 3,964 deaths, including those truck occupants. The total number of truck-involved accident injuries, however, was down substantially in 2013 — a 9 percent decline to 95,000. Again, here’s hoping it continues. The Chicago Tribune recently ran this story via Bloomberg exploring antiquated highway off-ramps and cloverleaf intersections and how they might be contributing to truck-driver deaths. Part of the story leads into exploration of the hold-up of NHTSA’s work on a rule to mandate Electronic Stability Control in new trucks, which Bendix reps at the Mid-America Trucking Show last week speculated would be on the books this year. Watchers hope such technology, widely utilized, will ultimately reduce the risk of truck rollovers, whether infrastructure is designed better to help mitigate them or not. And whether or not the profusion of reckless passenger-vehicle drivers is mitigated. Overall, the Tribune/Bloomberg story’s worth reading, but it’s the framing anecdote that is its most telling feature. Reporter Keith Naughton tells the story of Walter Price’s rollover at the No. 1 hotspot for such truck accidents, according to an American Transportation Research Institute study: Exit 238-B on I-75 in Georgia. As Price began to exit there, a four-wheeler darted in front of him and quickly slowed to take the exit. In his move to evade the four-wheeler, Price (with his wife asleep in the bunk) couldn’t keep the rig upright. Holly Caskey and other department managers at Admiral Merchants Motor Freight (AMMF) used to hold a weekly conference call for all new drivers to complete orientation training. The call lasted several hours and “you couldn’t tell if they were listening or paying attention,” recalls Caskey, director of safety for the Minneapolis, Minn.-based flatbed carrier. In early March, AMMF discontinued this practice in favor of a custom, orientation training program from Instructional Technologies, Inc. (ITI). Drivers now complete an interactive training program at their own pace, online, and have to answer questions correctly to proceed. The new training program made it possible for AMMF to shorten its orientation period by as much as one week. Previously, drivers could have completed a drug test and other pre-employment work by Thursday, for example, and then wait until the following Wednesday for the training meeting before they could be dispatched on their first load. Online training not only condenses the hiring process; it also skirts the boundaries of time and geography to get training out to drivers at the right moment. And by all indications, motor carriers will be using it to reach drivers faster and more frequently than ever before.According to the most recent estimates by the American Trucking Associations, truckload fleets could immediately fill 35,000 to 40,000 driving positions not counting those seats they need to fill because of turnover, which has increased to an annual rate of 90 percent or more, on average. Brown Integrated Logistics, a Lithonia, Ga.-based truckload carrier, tests drivers’ skills and knowledge when it brings new driver recruits through orientation meetings. Rather than move drivers through at the same pace, it assigns online training courses to those in need of additional help for certain topics, says Brian Kinsey, president and chief executive officer. The company also uses online courses from Vertical Alliance for remedial training. Kiosks are set up in all terminals, shops and warehouses. Drivers can also complete training using their own computers. If a driver has an hours-of-service or maintenance violation, for example, they are assigned courses on these topics. Also, if drivers miss a required quarterly safety meeting they must complete a course on a topic that was discussed at the meeting. Some of the companies that develop content and technology for online training are working on the next evolution: a closed loop process. Whereas fleet managers have to manually assign training courses to drivers today, in the future, training will be automatically assigned or at least recommended to drivers based on individual circumstances. Today, fleets that use J.J. Keller’s online Encompass portal to manage driver performance and compliance can track courses their drivers have completed from the online Training on Demand service, says Brian Kubiak, J.J. Keller’s director of marketing for training. J.J. Keller is working to make training content more closely integrated with its end-to-end compliance management platform, he says, which includes an Electronic Logging Device (ELD) that uses smartphones and tablets for a display; a back-office driver management system, Encompass; and the Training on Demand courses. When a violation is detected, such as a driver going over his limits for hours of service or not completing a pre-trip inspection, a fleet manager could assign a recommended course to the driver through an integrated workflow. “The vision is to close the gap between gathering data and pushing back training to the driver,” he says. About 1.5 years ago, ITI rebuilt its Pro-Tread training courses using HTML-5 to be mobile friendly. Previously its courses were designed using Adobe Flash which was not always compatible with mobile devices, says Thom Schoenborn, vice president of marketing for ITI. ITI is now working with the major providers of mobile fleet management platforms to connect data — such as the conditions surrounding a hard braking or speeding event — to an action in the form of a training course. Perhaps winter weather was also a factor in the event, in which case a driver might need to complete a course in winter driving as well as a course on space management. Schoenborn predicts that this next phase in the evolution of Pro-Tread, called “directed training,” will be ready within 18 months. Next week, CCJ will explore additional technologies such as video recording devices and advanced scoring systems that are now being used by fleets to make their driver training programs more efficient and effective.